Built on the basis of Customer Relationship Management, Microsoft Dynamics 365 is a complete management system which enables companies to be ever-present, to sell efficiently and productively and to use more intelligent marketing. Microsoft Dynamics 365 offers a strategic view of businesses, decision-making functionalities and productivity in one Microsoft solution. Microsoft Dynamics 365 is available via Cloud, on site or with a hybrid combination. What is CRM? Customer Relationship Management is a professional solution which helps businesses improve their marketing, sales and customer service in order to reach a high level of operational efficiency while, at the same time, improving their customers’ experience. What can CRM do for my business? 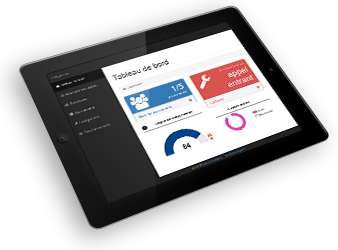 Customer Relationship Management (GRC in French) contributes to a reduction in costs and an increase in profitability by organizing and automating the business processes which nurture customer relations and satisfaction, both for sales and marketing activities and for customer services. CRM solutions offer a return on investment thanks to the automation of marketing and sales operations and the optimisation of customer service. 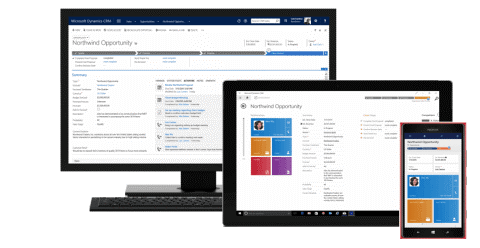 Structured around the main CRM functions, which are sales, marketing and customer service, the Microsoft Dynamics 365 service is also broadened to incorporate numerous complementary features, such as finance or projects, which makes it a complete management solution. Microsoft Dynamics’ Sales functionality provides a complete and intuitive solution, which enables sales reps to become more productive so they can concentrate on the essential part of the job: offering an exceptional customer experience. The interactive dashboards will give managers complete control of the sales activity. Promote your business and improve your sales by using Microsoft Dynamics CRM’s targeted marketing campaigns. Create activities for each campaign and allocate them to different members of the team. Follow the customer replies and the costs for each campaign. Manage service demand by optimising your working hours and your schedules by providing your staff with and using forecasting tools to increase efficiency. Give your support services all the information they need in order to provide your customers with a flawless level of customer service. Automate your customer satisfaction surveys and analyse the results. As a complement to Dynamics 365, modules such as Microsoft Social Engagement (listening to social media) or Microsoft Dynamics Marketing (advanced Marketing) meet any analysis requirements brought about by new practices, such as social media or mobility. Stay in touch with your customers at all times, wherever you are. Wherever you are, work with modern and feature-rich mobile applications. Manage data quickly with the help of intuitive voice commands to create new documents, schedule meetings, set reminders and find information. Work at any time, wherever you are, with on-line and off-line mobile applications. The Microsoft Dynamics 365 application for Outlook makes it easy to monitor e-mails, synchronize appointments and add contacts from an e-mail via a PC, Mac or mobile device browser. This application allows you to use CRM commercial functionalities, even in off-line mode. You do not have to close Microsoft Dynamics 365 to analyse your data. Now you can carry out a quick, specific analysis with the help of Microsoft Excel Online within your CRM. The convergence of your business telephone systems. 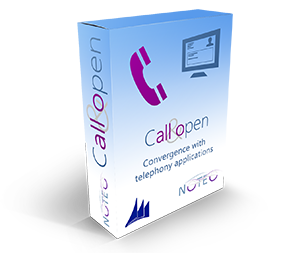 Call & Open is a telephony convergence application developed by NOTEO which is totally integrated with Dynamics 365. Call & Open, which is very popular with sales administration and support services, offers numerous features, in particular the automatic extraction of a CRM file from a call not only on a landline but also on a mobile phone. This option is offered as a Cloud contract. NOTEO’s web portal allows real-time access to information in Dynamics 365 from a web browser. Principally aimed at your customers or partners, it enables the swift input of information, such as requesting a quote, placing an order, consulting an account, requesting a service.